LANDO: All wings report in. RED LEADER: Red leader standing by. GRAY LEADER: Gray leader standing by. GREEN LEADER: Green leader standing by. REBEL PILOT: Lock S foils in attack position. 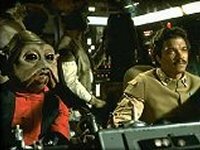 ADMIRAL AKBAR: May the force be with us. NIEN NUMB: Eemoatey Beaty Moatey Dea. LANDO: We've got to be able to get some kind of reading on that sheild, up or down. NIEN NUMB: Uhhhh Moatey Eedoh. LANDO: Well how could they be jamming us if they don't know... if were comming? Break off the attack! The sheild is still up! REBEL PILOT: I get no reading... are you sure? LANDO: PULL UP! ALL CRAFT PULL UP!! ADMIRAL ACKBAR: Take evasive action! Green group stick to sector 47. 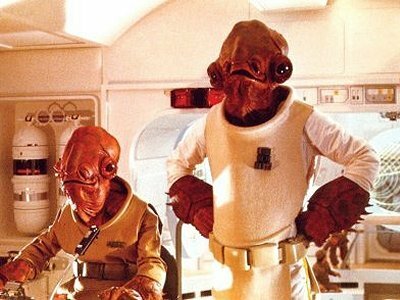 MON CALAMARI OFFICER: Admiral! We have enemy ships in sector 47.